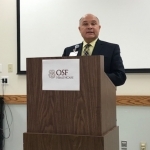 OSF Healthcare could debut another entryway into its medical services. St. Elizabeth Hospital President Ken Beutke says the hospital just got a new special vehicle. It’s not quite ready yet and Beutke didn’t say when it will be. He says it’s another way the hospital is trying to reach rural communities and meet people where they are.